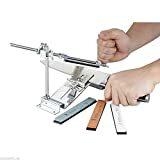 Wicked Edge Sharpeners have won many awards in recent years, and for alternative high grade sharpening tools they are certainly a company to watch. Their accolades include, ‘Accessory of the Year’ for two years in a row at BLADE Show (2009 and 2010), and most recently Wicked Edge have claimed the Kitchen Innovations® 2014 Award for Best Professional Series Knife Sharpener. Culinary professionals throughout the United States are using the Wicked Edge range of sharpeners, so its due time that Sharpen-up explored what all the fuss is about. The company actually began as result of founder Clay Allison’s thoughts on what was wrong with conventional electric knife sharpeners. He felt that even top of the range electric sharpeners created edges that were only temporarily sharp, with the knife becoming dull, all too quickly. Manual sharpening systems and vice tools, provided a better finish, however they were awkward and often time consuming to use. Clay started Wicked Edge and came up with a system that addressed these issues. With patented knife sharpening technology, the Wicked Edge range goes away with electricity, favouring a manual approach where the knife is held at the perfect angle for sharpening. The operator then has full control of various grades of diamond grit grinding stones that are designed to give a perfectly shaped edge, while still being very fast and easy to use. The latest in the Wicked Edge Range, the Field and Sport, and the focus of this review, is actually designed for survival and sporting knives. In short, anything you might use out in the field. At first glance, the system does not look ideal for out in the field use, and in many ways it is not. You are still best placed to have a manual pocket knife sharpener in the kit bag or pocket while on the go, and use the Field and Sport to really take care of your tools where you have the space and time to carry out the relevant maintenance. Having said that, the kit does come in an easily portable travel case, meaning you can always drop the Field and Sport in the back of the car and use it, wherever you see fit. This really is a versatile knife sharpener, with the ability to sharpen from a razor sharp 15° to a durable 30° in 2° increments. This means virtually every type of knife is covered, whether you need to sharpen your straight razor, folding, serrated, paring, survival, pocket, or kitchen knife, the Field and Sport will be able to take care of it. 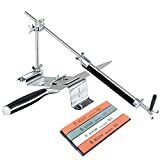 The kit comes of the shelf complete with a superior range of sharpening stones. 100, 200, 400 and 600 grit stones are all there ready for you to use. This really is the system for the discerning knife sharpener. If you want ultimate control over the way you sharpen your knives, you need look no further. However, what about the patented technology we touched upon at the beginning of this article? 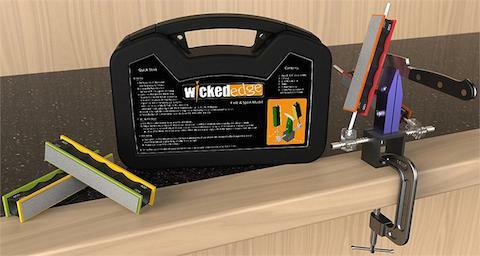 Well the Wicked Edge Field and Sport, carries on the tradition of earlier products in the range, with innovations and improvements such as the neoprene padded jaws, (ultimate protection for expensive knives) and the one knob clamping mechanism that makes operating the tool easy enough for anyone. 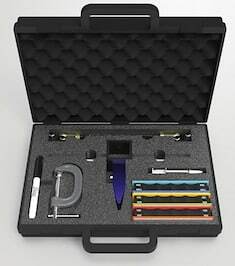 What more can we say, precision sharpening, ultimate control and almost all knife styles catered for. Add that to the increased portability of the Field and Sport, and you have what might be the best ever sharpener for survival knives. Lightweight carrying case that easily clamps to any firm surface with the included C-Clamp. Easy to use angle adjustment with 1° increments ranging from 13°-35°, ball joint pivots and micro angle adjustments. Upgraded Pro-Pack II angle system with ball joints and micro angle adjustments. Machined from aircraft-grade aluminum, stainless steel and space-age composite materials.